When you are working with COM objects, you might want to find out what methods are available.Then, you'd probably search for a documentation. $variable = New-object -ComObject "ProgID"
Then, you could just type in the variable containing the object to see it's current properties. To see it's available properties and methods, you can use the Get-Member cmdlet. You can try it yourself with "Shell.Application" as the ProgID. Dynamic Hotstrings Library - Create hotstrings with variables and regex! Me too! It's sooo much better than using the cmd. I mean it's features doesn't even start to compare with cmd! Thanks for pointing it out, It's corrected now. This example worked great as described. Without knowing to plug in "InternetExplorer.Application" as the parameter for the New-object command, how would I bring up a list of available applications that are supported? Ok, so when I list the available ProgID names I see "InternetExplorer.Application.1" listed. Based on this I assume the ".1" can be removed. I also see "LogMeIn.Systray.1" and "LogMeIn.GuestInvite.1". I would like to see their available COM options, but when I type "$LMI = New-object -ComObject "LogMeIn.Systray" (and also the same command with ".1"), I get an error. Does anyone know why these errors appear and what they mean? sorry, I can't really work on that because that COM object isn't registered on my pc. registered (Exception from HRESULT: 0x80040154 (REGDB_E_CLASSNOTREG)). + $LMI = New-object -ComObject "LogMeIn.Systray"
Gui, Add, ListView, r10 w800, #|ID|Name|Kind|DocString  ; Create a ListView. LV_ModifyCol()  ; Auto-adjust the column widths. Gui, Show,, % ComObjType(sd, "Name") " Interface"
GuiClose:  ; Exit the script when the user closes the ListView's GUI window. t .= ID "|" StrGet(Name, "UTF-16") "|" InvKind[n] "|" StrGet(DocString, "UTF-16") "`n"
With this script you simply input the COM object to create and get the members and other info in a listview. 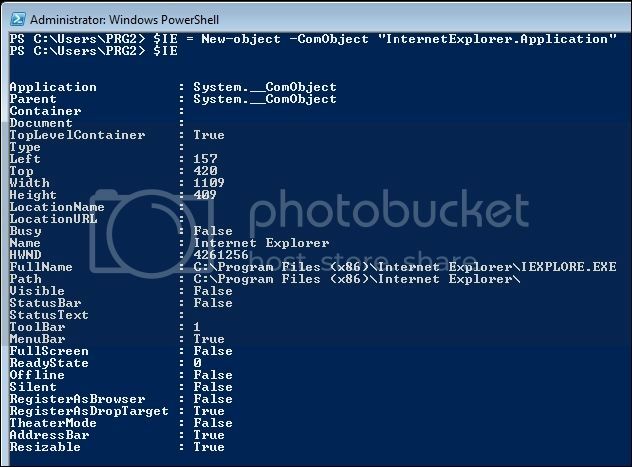 So no real need for powershell when looking for COM object info of this kind. Nice I've saw mentionings of the iTypeInfo but couldn't figure it out, if all you want to look at is the methods this is nice. 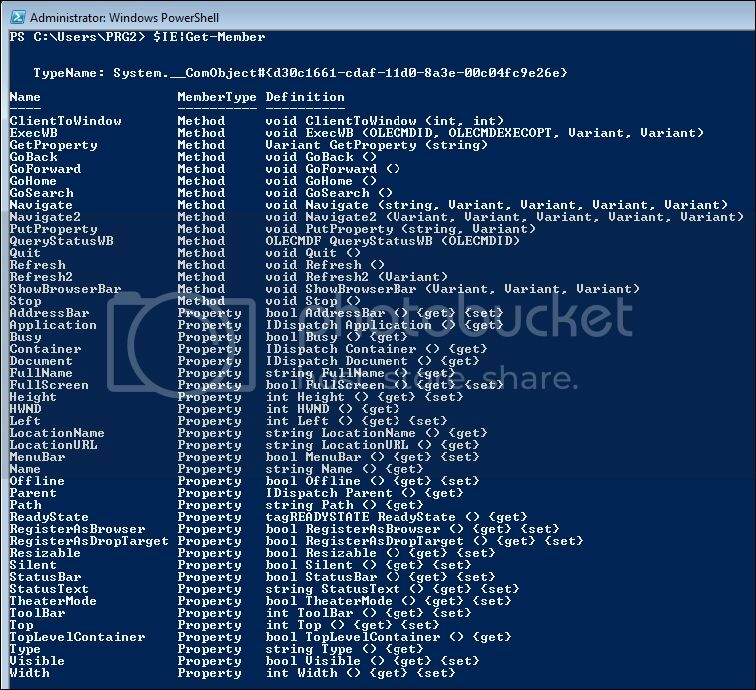 However I would say PowerShell is still better in that you can test it dynamically, you have a console you can continue to type code into, I really wish AutoHotkey had something like the ruby irb! ; Then Get-Member on a method or property of that object, then Get-Member on a method or property of that method or property etc. What if I wanted to find out what methods and properties were available to the document property of the $IE InterenetExplorer.Application object? I tried things like $IE.Document|Get-Member but it throws an error. Also, is there a way to use commands like this on a current web page that I have open in IE? It would be great for testing this way to find out if commands will work before sticking them into AHK. You need to navigate to a page before calling Get-Member on the Document property, something like '$ie.navigate("http://www.google.com")' then you can do '$ie.Document|gm'. There is a way to use similar commands in most browsers, you need to access their 'console', for IE you can hit F12 to open the developer tools, go to the console, then type something like 'document.getElementById' or something, note in my version of IE after I type 'document.' a list of possible commands is shown. ... is there a way to use commands like this on a current web page that I have open in IE?